Ticket to Ride: New York is the latest in the long-running series of Ticket to Ride games from designer Alan R. Moon and published by Days of Wonder. The twist on this latest version is its smaller board and considerably shorter playtime of 10-15 minutes. Another interesting note, regarding retail availability, is that this title will be a Target exclusive, selling at the big box retailer for $19.99. Ticket to Ride: New York comes in a square box that is just a bit larger than the box for two-player games like Patchwork and 7 Wonders: Duel. The game board unfolds into a map of Manhattan, and, like the game box, takes up a lot less table space than the earlier entries in the series. Instead of train pieces, this version comes with little plastic taxi cabs for players to create routes on the board. The game plays up to four players, so there are fifteen cabs in each of the four player colors. Unlike the other games in the series, there is no in-game scoring in Ticket to Ride: New York, so there are no scoring markers, and the edge of the board is not ringed with numbers. Instead, the game includes a scorepad and a sharpened pencil. All of this fits into a nice molded plastic insert in the box. The artwork on the box, however, is an eyesore -- an assortment of random characters that I believe are intended to evoke New York, including a greaser that looks just like The Fonz, which I don’t understand, as Happy Days wasn’t set in New York. This version plays almost identically to previous Ticket to Ride games. Players collect cards of different colors and use them to complete routes matching those colors on the board, in an effort to fulfill destination cards they’ve drawn and score points. In Ticket to Ride: New York, players navigate a smaller board with fewer pieces while connecting popular NYC tourist attractions for bonus points in addition to their destination cards. Some of the key differences include the aforementioned smaller board and fewer components, which create its shorter playtime. Also, gone from this version are intra-game scoring and the "longest route" bonus. This is a case of a game delivering exactly what I expected from it -- a Ticket to Ride experience that plays in 10-15 minutes. On the positive side, the game sets up more quickly, takes up less table space, and can easily be played over a lunch break or on a work night without sacrificing sleep. There is much less top-decking for cards, as the longest route in this game is a length of four, and there is only one route that long on the board. 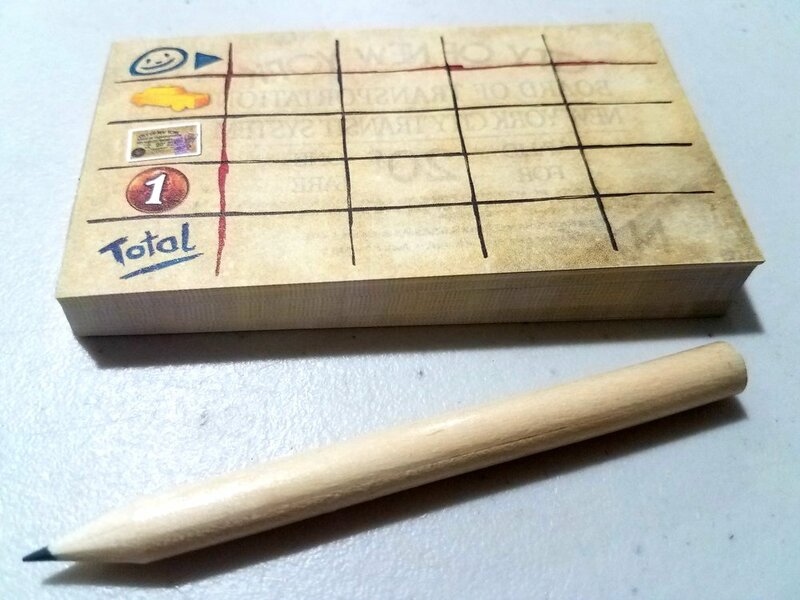 Scoring once at the end of the game also speeds up game play, as players don’t need to remember to keep moving their scoring markers up a few points at a time throughout the game. Conversely, the game ends very quickly, and may leave some players wishing for the longer experience that other Ticket to Ride games deliver. There are no five and six length routes, so the “rummy” experience of collecting matching cards is diminished. The smaller map has nothing even close to 20+ point coast-to-coast destinations to work for as a long-term goal, because there simply is no long-term in Ticket to Ride: New York. Starting with only 15 taxis, but having the same end game condition trigger -- when a player only has two taxis remaining -- makes the game much more of a straight race to complete destination cards and end the game as opposed to the other, longer versions of Ticket to Ride. Depending on your point-of-view, this could be viewed as a positive or a negative, but it is worth noting. I wrote an initial impression of Ticket to Ride: New York instead of writing a full review because, to be honest, there isn’t really enough to say about it to warrant a full review. At the end of the day, this game will be a situational success -- it will be great for people that either want or need a 10-15 minute version of Ticket to Ride, or want to use this abbreviated version to introduce it to others that aren’t familiar with the Ticket to Ride series. Ticket to Ride: New York isn’t as satisfying to play as longer versions of Ticket to Ride, because it loses the strategy of building longer routes across the board, and the maneuvering and blocking that accompanies that aspect of the game. As for people that don’t enjoy other Ticket to Ride games, there is nothing here to change their opinion, other than its shorter playtime meaning they’ll be spending less time playing a Ticket to Ride game. A final tangential observation -- likely sparked by seeing this game’s box size being similar to the popular two-player game box size -- I am surprised there is no two-player only Ticket to Ride: Duel game. Using the same size box and the same number of components as Ticket to Ride: New York, but instead giving two players each thirty trains, Alan Moon could have created a Ticket to Ride experience that played in under thirty minutes and satisfied couples looking for that quicker experience, but still had more decision space and depth than this version provides.